The world would be such a nice place if each individual realises the importance of nurturing and expressing the noble quality of gratitude in one’ life. First we show gratitude to GOD, and, as an after-effect, we end-up being grateful to all. Thank you Swamiji for sharing such wonderful thoughts with all of us. Makes so much sense when Radhanath Swami describes on Gratitude. Hope they all remain etched in my heart and show in my actions. Maharaj,we are very fortunate to have a pure soul like you among us. We hope and pray or your blessings. What a explaination here buy H.H. Radhanath Swami Maharaj, got a great lesson from this how and why to be greatful. Thanks Maharaj! Radhanath Swami brings home the point that all these GOD-ly qualities are not something lying out there. They all lie within… seek and thou shall find. Radhanath Swami Maharaj explains the real import and importance of gratitude. It is so fulfilling at heart to be grateful otherwise without gratitude we feel so much frustration.Thank you Radhanath Swami Maharaj for this wonderful words. 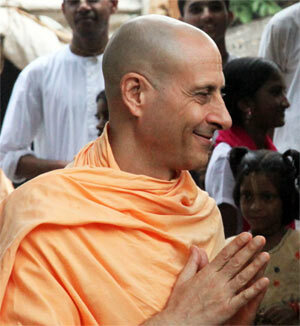 Thank you RADHANATH SWAMI for giving us the secret of satisfaction in life.I’ll try to practice it. Thank you Radhanath Swami for making us really understand the value of gratefulness. A very clear and nice explanation by Radhanath swamiji about Gratitude.One must try and develop this quality.Thank you very much. Very very simple and realistic quote.Thank you Maharaj. We have to be grateful to Lord and try to come closer to God and learn to overcome the obstacles of life.Thank you once again for your wonderful words. It was Crystal clear. I got new tool to face this life. 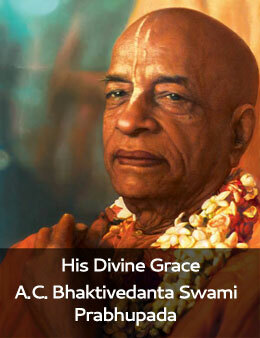 Because Maharaj remembers Prabhupada every moment out of his gratefulness he is able to inspire millions of fallen souls into Krishna Consciousness. Thank you Maharaj for everything! Thank you HH Radhanath Swami maharaj for explaining us the importance of gratitude in our spirtual progress. Thank you HH Radhanath swami for explaining us the importance of gratitude in our spirtual advancement. Gratitude is really very important in every walk of life especially in spiritual life. it is one of the godly qualities. Thank you very much Radhanath Swami for bringing out the importance of Gratitude so wonderfully. Thank you Maharaj for the wonderful lecture. Gratitude is a divine quality. It is easier to feel gratitude when we feel happy. But at times, when we go through challenges, we forgot to exhibit this behavior, unfortunately. Actually, from your article, we can understand that one must exhibit this quality in every situation.!!!! With gratitude in every situation one can advance so much and be satisfied. It is depicted by Radhanath Swami when he was travelling in search of GOD and staying in Himalayas in most austere conditions. Thank you Radhanath swami for this wonderful article on gratitude. Thank you very very much H.H. Maharaji for guiding in the secret of gratitude that will help us how to advance in spiritual life. Very true! Gratitude is very important for us to grow spiritually. We should be always grateful to the Lord for whatever he has given us(though we don’t deserve it)and to people who do good to us. Radhanath Swami is so nicely describing the importance of Gratitude. Very true! We should show our gratitude first to the Lord and to all others who have helped us in any way. Without gratitude, we cannot progress in our spiritual lives. Hope we can develop this attitude of gratitude without which our spiritual progress is very difficult. It’s a little easier to be grateful to the Lord for the good things but very difficult to be grateful for the bad situations in our lives. On the contrary, we blame God and others for the miseries that we go through.Hope we can cultivate this attitude of being grateful for both the favorable and unfavorable situations. Without gratitude, even in the most favourable situation, we cannot really progress – eye-opening words! Wonderful article on gratitude which is so important to our spiritual lives. Gratitude is a quality of the heart in which we can spiritually grow, in every situation. But without gratitude, even in the most favourable situation, we cannot really progress. -Wonderful realization!